Lasers are widely used for medical purposes; especially when a surgical knife cannot be used for a skin lesion, laser alone can yield excellent therapeutic effects. With the discovery of selective photothermolysis (SPTL) of laser on the skin, it has become available to choose an appropriate laser for effective treatment of various skin diseases, without many side effects. Laser resurfacing is available in ablation mode, where the irradiated laser vaporizes the moisture in the skin exfoliating the skin surface, or in contraction mode, where thermal activity induces skin contraction, thereby improving wrinkles and scars. Lasers for skin resurfacing targets the moisture in the skin (chromophore) and uses CO2 laser (10,600nm) and Er:YAG laser (2,940nm), which are in infrared region that absorbs well in the moisture. Laser resurfacing in ablation mode is useful for epidermal lesions, including various keratosis and nevi, as it exfoliates the skin surface. In this case, it is recommended to maximize the ablation on the skin surface so as to reduce thermal injury of the skin. As for the laser setting, the power should be increased (400-500mJ) and the pass number should be lowered for less thermal injury and maximal tissue ablation. Laser resurfacing in contraction mode is skin remodeling for skin contraction and increased resilience, not for exfoliating the skin. It induces collagen contraction in the dermis, thereby increasing the resilience of the aged skin and straightening wrinkles. The contraction mode is also available for various scar remodeling. In this case, lower output (250-300mJ) with multiple irradiation (2-3 passes) setting can induce stronger resilience effect. Early CO2 lasers in continuous mode created scars more frequently from thermal injury. 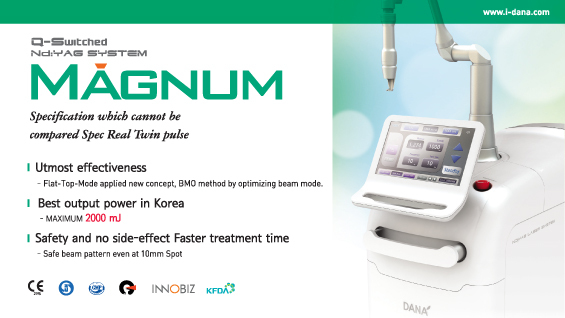 Pulse frequency was developed later and then the later ultra-high frequency Ultrapulse mode is capable of yielding maximum skin ablation and papillary dermis contraction at the same time by high output (500mJ) for a short period of time (1/1,000 sec). Figure 1. Removal of skin lesion using ablation mode of resurfacing laser. Figure 2. Improvement of wrinkles using contraction mode of resurfacing laser. 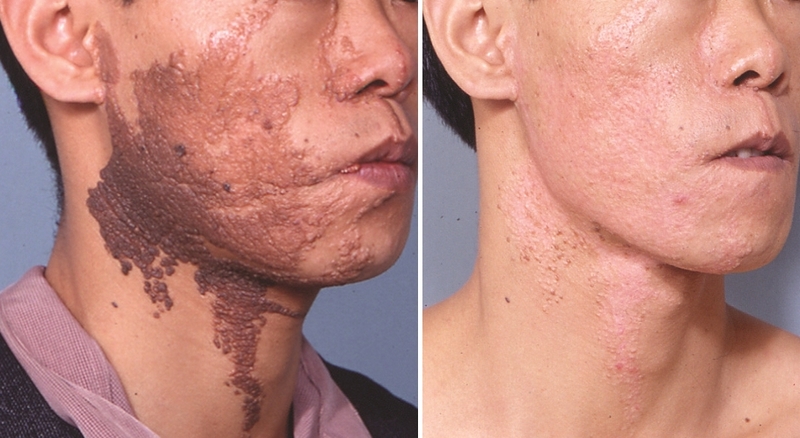 High power CO2 laser is useful for skin resurfacing but may interfere with the patient’s social life due to long-lasting erythema and frequent pigmentation (postinflammatory hyperpigmentation; PIH) after resurfacing. Er:YAG laser is favorable for skin ablation due to 10 times stronger water absorption coefficiency than CO2 laser. Early Er:YAG lasers have short irradiation time (pulse) on the skin, resulting in less thermal injury, but the lack of hemostasis and the hemorrhage absorbing laser energy prevents deeper resurfacing. 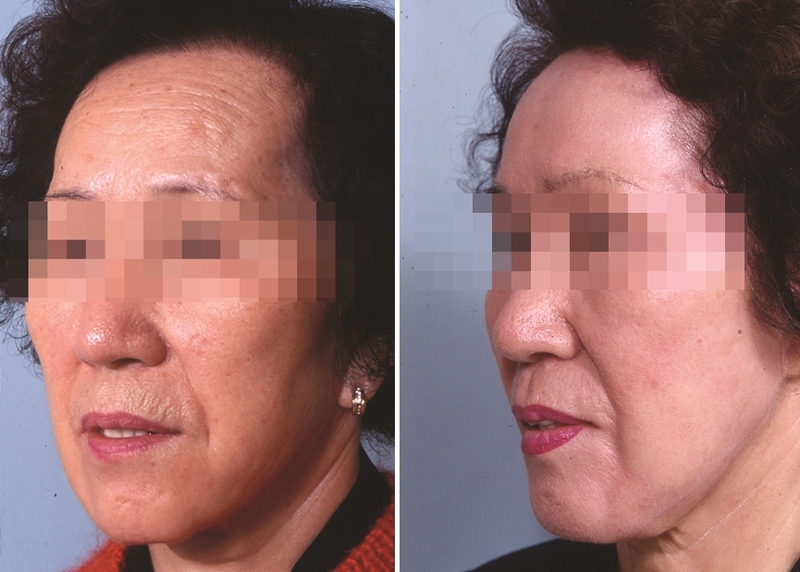 In order to prevent such disadvantages, Er:YAG lasers with longer pulse has been used with CO2 laser for skin resurfacing. The ablation threshold is 0.5-1.5J/cm2 for Er:YAG lasers, which is lower than 4.5-5J/cm2 for CO2 lasers. Er:YAG lasers cause less thermal injury, induces faster wound healing, causes less erythema and pigmentation, and provides more safety and comfort for patients, making it more appropriate for shallow laser resurfacing. I used Ultrapulse CO2 laser in the 1990s, and from the 2000s, when the device was no longer any use, I have been using Er:YAG laser. In order to achieve deep skin resurfacing as the CO2 laser, Er:YAG laser needs 2-3 times more irradiation for 2-3 times longer period of time. Therefore, I personally prefer Ultrapulse CO2 laser for full facial resurfacing. Patients often question about the difference between CO­2 laser and Er:YAG laser; I would explain to them that how to use the devices, rather than the difference of laser models, is more important. I would also describe CO2 laser as a sharp knife, which is effective when used well but may accompany side effects when used wrong, and Er:YAG laser as a relatively dull knife, which is safe but requires multiple use for deeper procedure. For some clinicians who ask which laser is more beneficial for resurfacing, I remark the fact that the purpose of resurfacing is more important and that a specialized costly laser is not a necessity simply for removing nevus. Lasers recently developed in Korea also seem to have excellent cost efficiency.